In 2017, as he was riding The Transcontinental Race, Silviu fell in love with the Slovenian landscapes and promised to return there again. THE SLOVENIA EPIC cycling tour is our own take of the most epic roads and climbs this country has to offer. Mangart (2.679 m) is the fourth highest mountain in Slovenia and close to this amazing peak lies the highest road in Slovenia, going all the way up the Mangart Saddle, at 2.055 m. Of course, we will be climbing this epic road for a spectacular view of the Julian Alps. Also on our list is the Vršič Mountain Pass. With its 1,611 m it is the highest road pass in the Eastern Julian Alps. The high-mountain road from Kranjska Gora through Vršič to Log in Trenta has 50 serpentines, 24 on the side of Kranjska Gora and 26 on the Trenta side. We will also be visiting Bled, the Alpine lake with the only island in Slovenia, which has been a world-renowned paradise for centuries, impressing visitors with its natural beauty, wealth of legend, and special powers to restore well-being. Last but not least, we will be cycling all the way to the Slovenian capital of Ljubljana, a green city, friendly for its residents and visitors alike. Its social and environmental awareness have a long tradition that you will feel with every step, and it is no coincidence that the city was named the European Green Capital of 2016. Experience the thrill of the Grand Tours as you start and end each day in a different landscape. 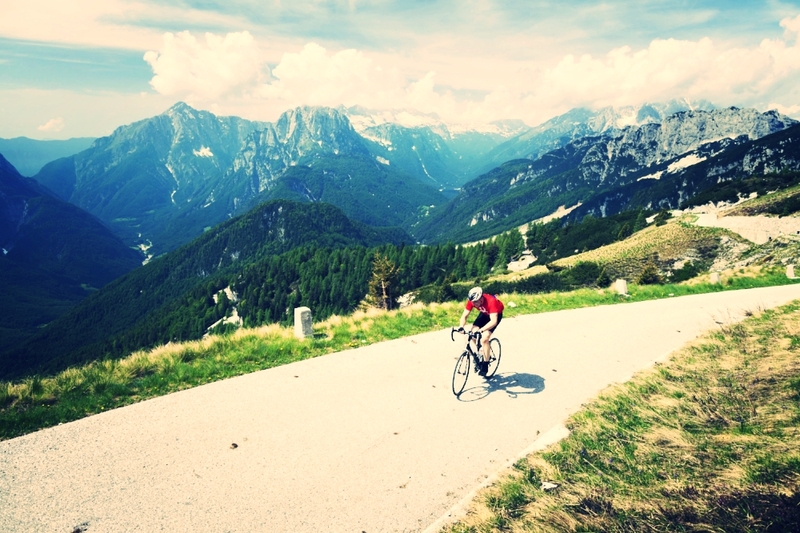 Climb the two most admired roads in Slovenia, the Mangart Saddle and Vrsic Pass. Our guides are passionate cyclists and know the Transfagarasan and its surroundings like the back of their palm. Our guests are supported by at least one expert guide joining them as well as a van and a driver. Luggage is transferred each day from one hotel to another. All hotels or guesthouses are carefully selected by our team for location, authenticity and character and are personally and constantly reviewed. We know how good it feels to have warm, healthy and delicious food waiting at the end of each hard day. We hand-picked the spots where will be eating to offer just that. Many thanks for the video to Matevz Lapanja. DAY 1: Arrive at Venice International Airport in Italy. Onward to Udine in Italy which is our host for the first night. DAY 2: We cycle this first day in Italy, from Udine to Tarvisio close to the Slovenia border on a spectacular bike route that connects Italy and Austria. The ride for today is 90 km // 1.200 m gain. DAY 3: From the picturesque town of Tarvisio we start our first challenge of this tour: the climb to Mangart Saddle (22 km, 6% average). The effort will be fully compensated by the glorious views of the Alps from the top. The ride for today is 70 km // 1.600 m gain. DAY 4: Another epic day is ahead of us. This time we climb up to Vršič Pass and, even though the climb is short (9 km, 9% average), it will test your already tired legs. The day starts in a gentle manner slowly going up through the Soča Valley, where you will enjoy of the most magnificent landscapes in Slovenia. In the evening we arrive in Bled, where we will spend the following two nights. The ride for today is 100 km // 2.000 m gain. DAY 5: By now, we're all definitely tired and we would deserve a break. But...as we don't really believe in rest days, instead of that, we'll have a shorter day as we explore the surroundings of Bled lake, all the way to Bohinjsko lake, another one of the landmarks in Slovenia. The ride for today is 70 km // 1.300 m gain. DAY 6: It's back on the road again as we make the final push from Bled to the capital city of Ljubljana via Škofja Loka, one of the oldest and most carefully preserved medieval towns in Slovenia. In the evening we arrive in Ljubljana and enjoy this beautiful green city. The ride for today is 90 km // 1.700 m gain. DAY 7: Departure to Ljubljana International Airport. We pay extra attention to choosing the appropriate places to crash at the end of a long day. All hotels or guesthouses are carefully selected by our team for location, authenticity and character and are personally and constantly reviewed. Most of them are at least 3* and 4* locations, some with Spa & Pool. Here you can find a selection of the most important question our clients usually have to ask us. What's the Martin Adventures difference and why we think you should choose us for your cycling tour in Romania.